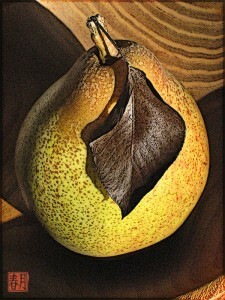 Discovered these wonderful little dessert pears at our local Santa Rosa farmers market one November morning. Went back this year and the vendor said the Seckel pears were all sold out by late September. Was sad to have missed them this year. Are you able to provide a print larger than 12 x 18? Sure…Christine ~ What size print are you interested in? I can’t personally make archival prints any larger on my printer, which has a maximum width of 12 inches (leaving 1/2 inch white margins for handling). I work with an excellent print lab, Bay Photo, that can provide larger prints on various surfaces from art papers, mounted canvas, photo papers, metallic surfaces, etc.